Coming back to Rome: cappuccio, rosette e Happy Hour! Recipe 88: As you can imagine I’m in Rome in these days. I came back for Easter and of course i’m not cooking much, thanks to my mum, but i’m trying to eat all the stuff i miss the most… so here a little list just to let you know, but i will also add a superquick recipe for a light lunch or dinner. Let’s start with the breakfast: there are no words to describe this cappuccino(also called Cappuccio in Rome) and this pastries filled with a cream made with almonds and pine nuts! Real paradise in Tornatora! Then of course lunch time: a good Rosetta (a bread really typical in Rome), with Mortadella, a particular kind of ham that is impossible to find in London (if you can, try it in a simple white pizza bread!) Or you can eat the Rosetta with Bresaola, Rocket salad and Parmesan. This is a classic light dish we often eat also as a starter, but it’s really a special mix of flavours. As you can see it’s very easy, but the bitter rocket, with the peculiar bresaola taste (and you can find this in London) and the sweet parmesan are just amazing together. Just add a bit of salt, oil, and i really like it with lemon too. Finally to close the day why don’t go for an happy hour? it’s very important everyone get it: happy hour in Italy doesn’t means they give you 2 drinks for one, but means you buy a drink and you can eat all the stuff is on the buffet. So basically if you are going to do (have?) an happy hour, means you are going to have almost a dinner, or an big aperitif, some drinks and nice finger food. We all love it and i was missing it a lot! Why in England they can not offer food with pints? This time i took a Spritz (cocktail mainly made with Aperol and Prosecco) with some fresh tuna rice and farro with vegetable, some good focaccia with rosemery, olives and tomatoes and a salad made by radicchio and cabbage. 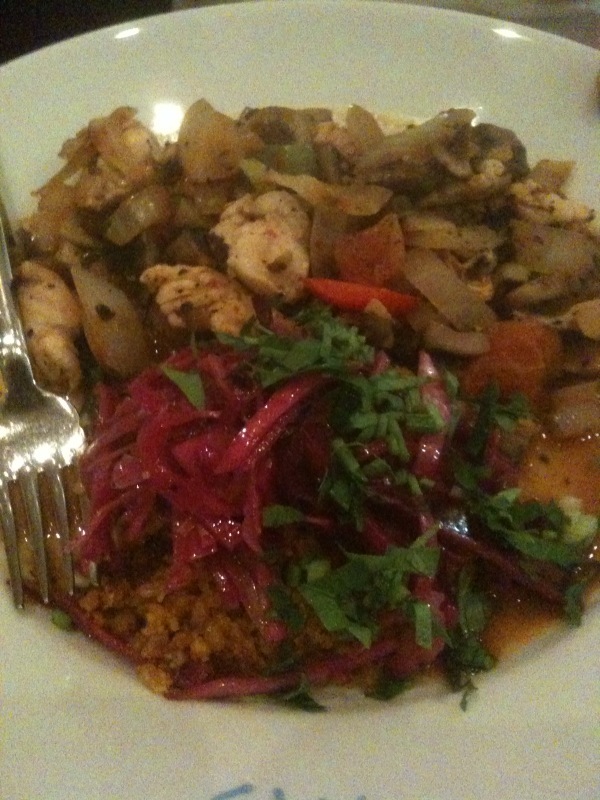 It’s the second time i have cabbage in my plate in these days and i have to say i like it a lot! Maybe i need to start using it more. 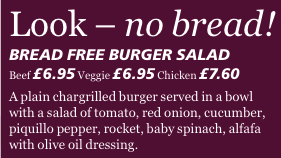 And not only… finally a burger chain that give you the possibility to choose for a dish without bread! In England there are different burgers chains. Nothing to do with Mc Donalds and not even with real diners, but little places where you can find massive nice and tasty burger, made with good meat, bread and the most different ingredients for a quite cheap prize. Served with chips or chicken wings or onions rings, are also a quite good amount of calories by the way. Finally a little help arrived for people like me who look for a normal social life without have to say no to any kind of dinner out: Fine Burger Co thought in something very easy and light. They take a nice burger, no bread, no cheese, no chips, but just a nice fresh salad, with tomatoes, peppers, some other simple ingredients and a light dressing, for a big and healthy dish. Thanks to this other chain to upgrade to healty food! PS. Mamy nella mia battaglia per poter mangiare fuori senza per forza dovermi ingrassare, ho trovato un altro alleato: e’ una di queste piccole catene di ristoranti che cucinano solo hamburgers ma buonissimi. Beh finalemente in cambio di servire solo paninoni farciti accompagnati da patatine fritte, hanno anche aggiunto l’opzione light, ovvero una bella insalata mista con hamburger. In questo modo ho la possibilita’ di mangiare una bella razione di carne con un contorno bello consistente, senza dovermi sentire ai margini della societa’ perche’ tento di resistere alle patatine fritte! E se un po’ piu’ di inglesi passassero dal Mc Donald a queste catene, gli farebbe sicuramente bene alla salute! Everyone knows London is so multicultural that you have the possibility to try here the most different restaurants and food, so some weeks ago we went to TAS, a turkish chain of restaurants. Of course we love Houmous and Tabule, but because we didn’t really know all the rest we decided to go safe with a set menu: Sahan menu… just 8,95 each. This menu give you four options for starters: Lentil soup, Tabule, Houmous and Ispanakli Yogurt, but we were so in love with all of them that we choose Soup, Houmous and Tabule: everything was really good and served with a special pitta bread, soft with sesame seeds and absolutely tasty. 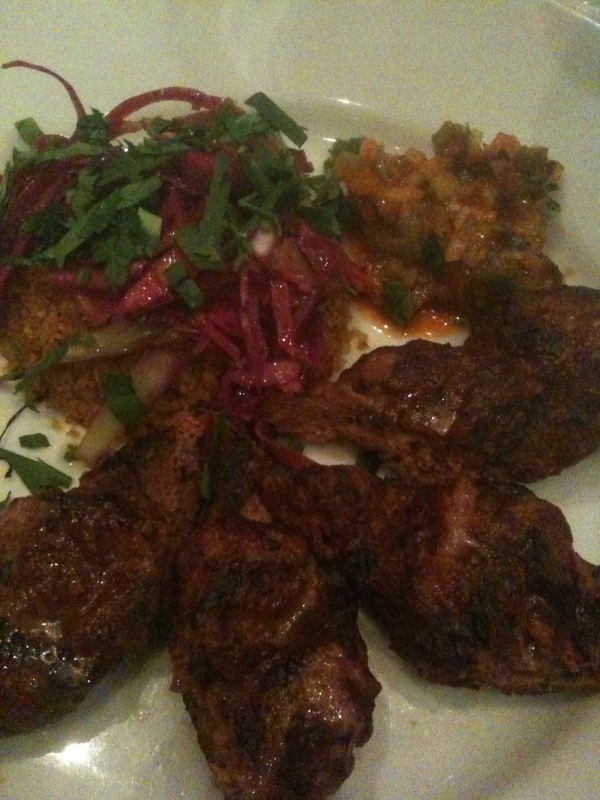 For main course we had instead Kofte and Chicken Guvesh with a very nice couscous in both. The Kofte are pieces of minced or ground meat — usually beef or lamb — mixed with spices and/or onions. The taste is quite strong but all was grilled and it was really good. The Guvesh instead is a kind of stew or chicken casserole made with mushrooms, onion and tomato. So finally the dinner was really interesting, different from what i normally eat, not heavy or particularly greasy at all and the flavors were really nice. If you also consider then the very cheap price and good service, i think you can have a try! PS. Mamy qualche tempo fa ho provato un ristorante Turco: volevamo mangiare qualche cosa differente e abbiamo visto che non era molto costoso e siamo andati. Vabbe’, considerato il fatto che io e Julio andiamo matti per l’houmous e il pane pitta che usano loro, diciamo che avvicinarci alla loro cucina non e’ stato poi cosi difficile e la carne ed il couscous come lo cucinano loro e’ proprio buono. Sono sicura piacerebbe anche a voi! Italian ice creams in London…the big challenge! As any other good italian, i love ice cream in any kind of season, weather, and time of the day. In Italy i was also living just on top of one of the most famous ice cream place in Rome… so of course now i miss a good ice cream a lot also if it’s winter!!!! 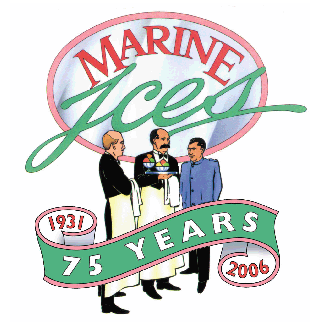 For ages i asked to other italians where they were going to eat a good and natural ice cream and often the answer was Marine Ices in Chalk Farm, so I finally decided to go and try. Unfortunately my experience wasn’t good at all: a part from the fact that the ice cream is very expensive, the taste doesn’t seems very natural and the consistency is horrible. You can feel some powder in it… nothing to do with the nice creamy italian ice creams! My boss instead used to love Scoop in Covent Gardens: here i have to say the consistency is good and the price is fear, but the taste also if good, could be even better. However this is better than the previews one. Of course i need to try some new shops recently opened (like the one in Selfriedges, in Portobello Road, in Holland Park…) but for the moment i can tell you the best ice cream i never eat in London is a little Ice cream stand in Westfield, the commercial centre in Shepherds bush. The ice cream is called Joe Delucci’s, they are italian and the taste and the ingredients are just amazing! It’s a bit expensive but i swear it’s worth it all!!! I absolutely suggest you to try some of the flavors and especially the Pistacchio… you will be without words. They use a super high quality of fruit and the taste is just unique. So especially now that is Christmas and everyone will go to the commercial centers to buy all the presents, it think a little break with an ice cream in Joe Delucci’s you can’t miss it. I hope you will enjoy and agree with me. Let me know! PS. Mamy non sai quanto mi manca Tony sotto casa a volte!! Insomma ero cosi disperata un giorno che ho iniziato a chiedere a tutti dove potessi trovare un buon gelato italiano qui a Londra. Quello di cui molti italiani mi avevano parlato si e’ rivelato una delusione. Quello che piace tanto al mio capo, e’ buono ma niente di spettacolare, mentre invece un giorno andando in quel grande centro commerciale in cui vi avevo portato a Natale, ne ho provato uno FENOMENALE… direi anche meglio di Tony. Gli ingredineti che usava erano freschissimi e molto ricercati. Avevano un pistacchio favoloso con tutta la granella dentro! Ultimamente hanno aperto qualche nuova gelateria in giro che non ho ancora provato, ma intanto ho parlato di quelle piu’ famose. Certo che Tony sia benedetto! 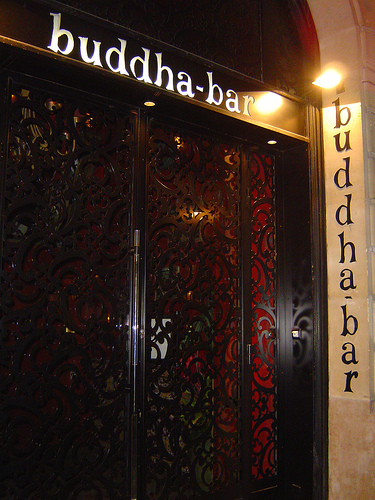 Another amazing place, finally here in London too, is the Buddah Bar. 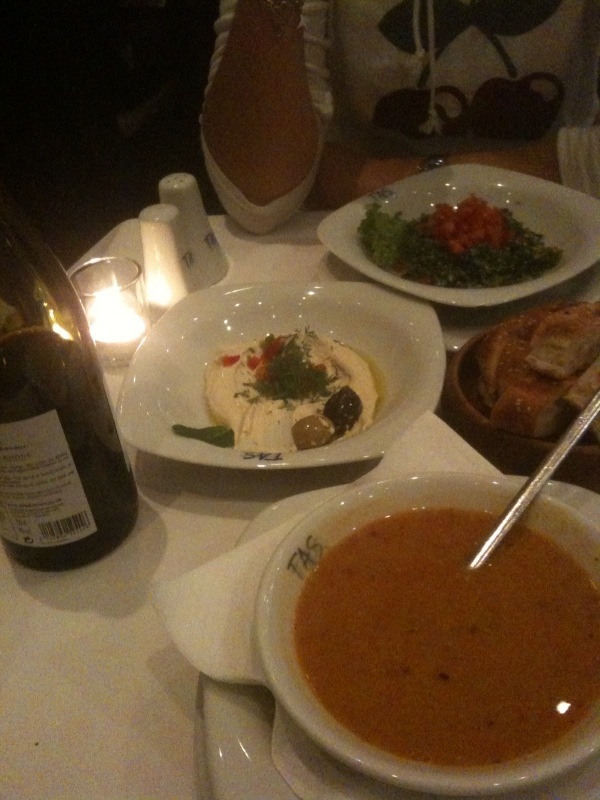 It opened not so long ago in Embankment, near the river and it’s always packed… now i will tell you why. Basically the secret is great food, cool ambient, amazing cocktails and fantastic music all night long. We went there just to stay few hours all girls and instead between some wine, some cocktails and the music we couldn’t go away anymore. They serve food in all little portions and we ate a particular kind of spring rolls served with sweet and sour sauce that was very good, but especially we drunk a CHILLI MOJITO and an ELEMENTAL cocktail (peach based) beautiful to see but absolutely fantastic to drink. The music is a mix of arab, indian and latin music at the beginnig of the night, to get then more disco around twelve. It’s of course a bit expensive but it’s a very nice place for a full night out. PS. Mamy con Anna e le ragazze ci siamo dedicate una serata fuori un po’ sopra le righe e siamo andate in questo locale molto conosciuto che sta’ proprio vicino al fiume. Si chiama Buddah Bar perche’ ha un grosso Buddah all’interno e l’ambiente e’ un po’ una fusione di culture asiatiche e arabe. E’ un posto molto curato e famoso ovunque per la musica che mettono: insomma una volta entrata e’ difficile andarsene. Hai visto che bei cocktails? Spaghetti alla carbonara… also in Holland! Recipe 119: This is so much a classic, that it’s a dish we cook often when we want to eat a good and quick plate of pasta. 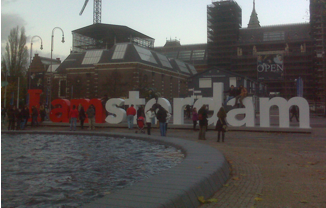 In fact in my recent trip to Holland, on my last day we ate at home and we cooked spaghetti alla Carbonara. Of course i first tried all the Dutch specialties , but a nice plate of pasta is very difficult to beat! However if you pass for Holland you will need to try the fresh made dutch waffles, the Gouda cheese, you need to eat out and try one of their mix-asiatic dishes (their colonies in Asia have created a nice mix food culture), the special queen Wilhelmina’s peppermints (but i can suggest you these very good gums too, also if the name is not really inviting) and finally you need to try one of the FEBO’s specialties and you can’t avoid that considering there are so many FEBO and in the weekend everyone goes around with french fries and junk food. But let’s comeback to the recipe of the pasta. The ingredients for 2 people are: 250 gr spaghetti – 2 fresh eggs – 1 onion – 75 gr pancetta – Parmesan (better if you can find Pecorino cheese) – salt – pepper. Very easy!!! Cut the onion in little pieces and put it in a pan with a bit of oil. If you want you can also give more taste to the oil adding a little piece of garlic that you can cook and then remove (Consider that the real Carbonara is just with oil and garlic, but if you put onion too, the taste will be even better). Then add the pancetta and in the meantime put the Spaghetti in hot salty water. Wait a bit for the pancetta to cook and in the meantime you can grate the Parmesan or Pecorino cheese (depending if you like a stronger flavor). Put the 2 eggs in a little container and mix a bit until you reach a worm yellow color. No comments about his portable colander! At this point when the pasta is ready (and still just a bit hard) drain it and place it back in the sauce pan with the pancetta and onion, Parmesan or Pecorino, mix all and then add also the 2 eggs, without put anything on the gas. This is the secret of this pasta. You don’t need any cream, but just the eggs will give the necessary creamy consistence to the dish. When ready just serve with some more Parmesan and black pepper. PS. Mamy questa e’ la carbonara che abbiamo fatto con Carlo prima che prendessi il volo. Avevamo una fame e devo dire che lui e’ stato bravissimo. La cottura era perfetta ed immagina che c’aveva anche il pecorino! Che buono!Chi la batte la carbonara? Invece prima ho parlato di alcuni prodotti tipici danesi, che a dire la verita’ non sono moltissimi, ma buoni, specialmente i waffles.